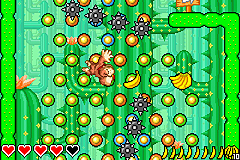 DK: King of Swing is a puzzle game starring Donkey Kong for the Game Boy Advance. It is the first installment of the DK series. Its gameplay is similar to the NES game Clu Clu Land, but has been re-formatted in certain aspects to provide more of an adventure game feel. In this game, Donkey Kong and Diddy Kong must quest across five worlds to win back the Jungle Jam medals that King K. Rool has stolen and scattered across the levels. The game is the first Donkey Kong franchise game developed by Paon for Nintendo, who also made the sequel, DK: Jungle Climber and the racing title Donkey Kong Barrel Blast. The game takes place during the Jungle Jam Tournament, where a huge festival held occurs. During the tournament, medals (which are actually DK Coins) are handed out as prizes to participants in contests like breaking barrels and jumping pegs, with the winner being crowned the hero of the jungle. King K. Rool, however, steals all the medals before the tournament commences, proclaiming himself the jungle hero. Donkey Kong pursues King K. Rool to get the medals back and restore peace to Donkey Kong Island. After traveling through four different regions, gaining the stolen medals dropped by K. Rool, Donkey Kong arrives on the King Kruizer III. Confronting K. Rool, DK beats the king in both a climbing race and battle, claiming the last medal. He leaves with all the medals on K. Rool's hovercraft while the flying fortress falls out of the sky. Adventure: The main mode of the game. Single Jungle Jam Tournament: There are a total of twelve events that can be played in this mode. The player can choose between Donkey Kong, Diddy Kong, Dixie Kong, and Funky Kong, the player can unlock Bubbles, Wrinkly Kong, King K. Rool, and Kritter too. The CPU uses the other characters. The first accessible events are: Climbing Race 1, Climbing Race 2, Obstable Race 1 and Attack Battle 1. 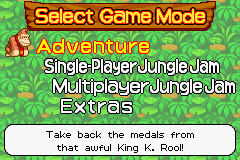 Multiplayer Jungle Jam Tournament: The same as above, but in multiplayer with four players using the GBA Link cable. Extras: It features Cranky's Lectures (the tutorial from the beginning of the game), a Time Attack Mode, and Diddy Mode, which allows the player to use Diddy Kong in the place of Donkey Kong during the Adventure mode. The tutorial stage is no longer present. Bananas laying out in the open are no longer there; the player can only collect them by destroying enemies or crates. Crystal Coconuts were removed, and as a result, Bonus Barrels and the bonus stages they led to are no longer present. Diddy is slightly faster and jumps slightly higher than Donkey Kong. A Time Attack appears in DK: King of Swing, where it can only be played after the player has completed the adventure mode. It can be found under the Extras menu. When the player selects the mode, they are given a list of every level, each with its only best time that the player can beat. Three other times also exist in the high scores list that the player can beat. However, beating the times are optional and do not allow the player to unlock any new mode or item. During the mode, the player is given three hearts of life. If all three are lost, they must start the Time Attack over. 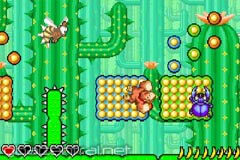 Additionally, hearts can be restored if they collect ten bananas and use them for Donkey Kong's "Going Bananas" move. Unlike in adventure mode, though, the player is given no bananas to start with and must find them around the course. After the level is completed, the player's time is recorded if it beats a score on the high scores list. Donkey Kong in one of the game's levels. As mentioned earlier, the gameplay is very similar to the NES game Clu Clu Land, and mainly consists of swinging across boards of pegs. 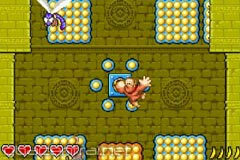 However, in this game the player must climb, swing, and even shoot their way to reach the top, all the while collecting the medals. The player cannot face the boss without beating each level; once all levels have been completed, the player may face the boss at the designated boss stage. After the boss is beaten, the player may continue to the next world. If the player chooses to collect each Crystal Coconut, hidden items concealed inside crates, boxes, nooks and crannies, or even inside enemies, Wrinkly Kong is unlocked as a player in the single player Jungle Jam Tournament. There are twenty Crystal Coconuts in all. The controls are made to be simple: swings Donkey Kong left, swings Donkey Kong right. If the button is held down, DK will swing on a fixed spot from left to right, and vice versa for the button. If the button is lightly tapped, Donkey will go flying of in whatever direction he is pointing. To get a better aim, DK must swing about until he is facing the right way. When on the ground, DK can walk about quite quickly using the and buttons; when they are tapped simultaneously he will lift off from the ground in a flying leap. Donkey Kong can also Attack by holding down both the and buttons at once. DK will clutch the pegs, and slowly start to glow red; once he is totally glowing, the buttons should be released and DK will go flying off into an aerial attack. Finally, DK can either Charge using the Button (uses ten bananas; restores one health unit) or Go Bananas using the Button (uses twenty bananas; makes DK invincible and able to leap great heights). Donkey Kong is the first Kong to be playable in Adventure Mode. He is also available in the Jungle Jam Tournament mode. In the Jungle Jam Tournament mode, Donkey Kong is the most balanced character statistically-wise, as his jump and attack abilities are at 3/5 apiece. Diddy reappears as Donkey Kong's buddy. He is available to play as in Adventure Mode, after the player defeats King K. Rool as Donkey Kong. Diddy is also a playable character in the Jungle Jam Tournament mode. His jump ability is high at a 4/5 due to his weight. However, this negatively affects his attack ability, as it is only at a 2/5. Dixie Kong is Diddy Kong's girlfriend. She is playable in the Jungle Jam Tournament mode. Her apparent feather-like weight results in her jump ability being maxed out at a 5/5. However, her attacking ability is as weak as possible, as it sits at a 1/5. Funky Kong makes his first appearance in any game as a playable character. He is the fourth and final starting character in the Jungle Jam Tournament mode. He prefers the attack-based contests, as his attacking ability ranks at a 4/5, while his jumping is at 2/5. These stats are exact opposite to Diddy's. Kremling appears as an unlockable playable character. He is simply a Kritter, but the game refers to him as "Kremling". Kremling is unlocked when the player earns 6 Gold Medals in the Jungle Jam Tournament. This game marks the first time where a Kritter is a playable character. His stats are exactly like Donkey Kong's: 3/5 jump, 3/5 attack. Wrinkly Kong is available to play as in Jungle Jam Tournament mode after the player collects all 20 of the Crystal Coconuts while playing as Donkey Kong in Adventure Mode. This game marks the first time Wrinkly is a playable character in any game. It is also the first time she appears as a ghost. Because of her weightlessness, Wrinkly's jump ability is maxed out at 5/5, tying her with Dixie Kong for the best jump rating. Her attack is weak, as it is only a 2/5. King K. Rool appears as the final boss in Adventure Mode. Upon earning 12 Gold Medals in the Jungle Jam Tournament, he is also available as a playable character in the Jungle Jam. This marks his first game as a playable character. He is the strongest character in the game with an attack rating of 5/5. His jump, however, is extremely weak, as it only ranks 1/5. Bubbles is unlocked after the player completes Diddy Mode while collecting all 24 Medals. She makes her first and only appearance in a Donkey Kong game. Her stats are the most balanced out of any character, as her jump and attack rate a 4/5 each. Cranky Kong returns as Donkey Kong's grandfather and mentor. His main role is to preside in Cranky's Lectures, where he teaches Donkey Kong the controls for the game and gives a couple of tips. Candy Kong's appearance in DK: King of Swing is extremely minimal, as she only appears in the opening cutscene in which King K. Rool crashes the Jungle Jam Tournament and in the final cutscene in which Donkey Kong has returned with the Medals. Bananas are common items that appear in every level. Each single banana adds one to Donkey Kong's stash, which could be used for Going Bananas or for replenishing health. Banana Bunches are found in most levels and add a total of five bananas to Donkey Kong's stash. A bunch of ten bananas is more rare than the other bananas, but are found in levels after breaking open barrels or crates. One bunch of ten bananas can restore one full heart of health. Medals appear in each level besides Banana Bungalow. They can be found in Bonus Areas or inside of barrels or crates. The gold variants are awarded after defeating a boss. 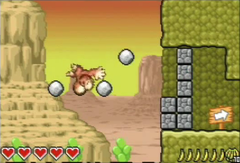 Crystal Coconuts are found in each level. They are usually found in similar spots to the Medal, and can also be obtained by defeating an enemy. Tires are common objects that can be bounced off, helping Donkey Kong reach high places that would not be reachable otherwise. Rocks are common items that are used to damage enemies or destroy breakable walls. Bombs are items that can break open obstacles or destroy enemies. They detonate withinin approximately five seconds and will cause one heart of damage to Donkey Kong if he holds onto it for too long. 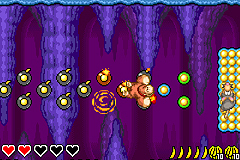 Mines are spiked objects that are common obstacles throughout some levels. They cause Donkey Kong one heart of damage if he makes contact with them. Mines can also move around, too. Cannons are objects that are encountered in the levels on the K. Kruizer III. They shoot fireballs at Donkey Kong in an attempt to cause damage to his health. Some cannons rotate towards the direction of Donkey Kong while others stay in the same position. Wooden Crates are large boxes of wood that can be broken by Donkey Kong with a simple attack. They usually take up an entire peg board, and, when broken, allow the Kong to progress up. 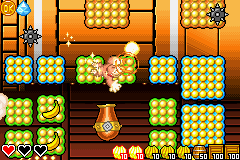 Additionally, wooden crates represent 100 bananas in the player's stash in the bottom right of the screen. Coconuts are objects that some Mini-Neckies shoot from their mouths. They cause one heart's worth of damage to Donkey Kong if it comes into contact with him. Coconuts can be destroyed if they hit a projectile that Donkey Kong throws, such as a rock. Standard barrels, if broken by Donkey Kong, reveal bananas or other items. Additionally, barrels represent fifty bananas in the player's stash in the bottom right of the screen. Question Barrels are like standard ones, where if broken they reveal something. These barrels reveal Peg Boards or activate doors. Booster Barrels are barrels that act as rockets and are steered with and . They are the subject of the level Booster Barrel Skyway. Bonus Barrels shoot Donkey Kong to a Bonus Area upon entering it. Barrel Cannons are enterable barrels that launch Donkey Kong in a given direction. Rolling Barrels are enterable barrels and their aims can be adjusted with the and buttons. Pegs are common objects in the game that have many different variants. Each variant performs a different function and assists Donkey Kong in reaching further areas. Pegs are single, floating studs that the Kongs are able to grab onto. They are the most common of all Peg variants and featured in Jungle Jam Tournament Events as well. Peg Boards are groups of pegs that the Kongs are able to climb on. They come in many different sizes, ranging from two by two pegs to five by six pegs. They are also the main obstacle in the Jungle Jam Tournament Events. Handle Pegs are wheel-like pegs that, if grabbed onto, carry Donkey Kong on a mechanism. These mechanisms run up and down or left and right. Switch Pegs can open doors or reveal new secrets if grabbed onto and pulled down with both hands. Jack Pegs are peg variants that operate mechanism if pulled down on repeatedly. They can open doors or reveal new peg boards. Spinning Pegs rotate quickly either clockwise or counterclockwise. If grabbed with the correct hand, they can launch Donkey Kong high up to new areas. Cracked Pegs are rare types of pegs that slowly fall once Donkey Kong grabs onto them. Conveyor Belts are variants of peg boards that slide Donkey Kong from up to down or side to side if he simply stays still while grabbing on it. They are common in Mine-themed levels. 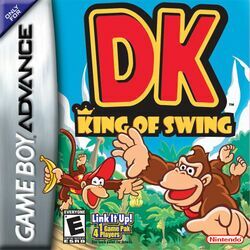 Game Boy Advance Craig Harris, IGN 7.8/10 "DK: King of Swing is a classic example of a Nintendo game attempting something that's both unique and familiar at the same time. It's a concept that could only be successful on the Game Boy Advance for its rather basic structure, but even with its simplistic design DK: King of Swing has a lot going for it. Simple L and R gameplay isn't enough to keep interest high all the way through, so it works best as a quick-shot experience." Game Boy Advance Frank Provo, GameSpot 7.3/10 "All told, DK: King of Swing is a unique and interesting take on the puzzle genre that people will either love or hate depending on how accepting they are of the game's innovative control scheme." Game Boy Advance Kristan Reed, Eurogamer 7/10 "But ignoring the entirely superfluous Jungle Jam, the single-player adventure more than makes up for it and although has arguably way too many incidences of annoying level design to get too excited about, for those with a steely mindset and a longing for something genuinely new DK: King Of Swing is a surprisingly worthwhile addition to the handheld (swinging) scene. Monkeys and bananas are still evidently doing it for us." DK: King of Swing went through some changes during its development. This screen shows five heart points, while in the final, there is only three of them. It was not possible to go beyond that number in the final release. Everything in this image is the same as it is in the final game, minus the five heart points and different background. This screen features explosive pegs that weren't present in the final game. These spikeballs were not found in this area in the final game. This area does not exist in the final game. For this subject's image gallery, see Gallery:DK: King of Swing. For a complete list of media for this subject, see List of DK: King of Swing media. The Donkey Kong Country Returns level "King of Cling" is named similarly to this game. This game marks the first playable appearances of Funky Kong, Wrinkly Kong, Kritter, and King K. Rool. This is the first, and currently the only game where Dixie Kong does not wear her top tied. This page was last edited on April 6, 2019, at 15:00.